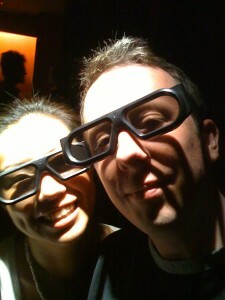 My wife and I at a movie theatre in Hong Kong to watch Up in 3D. Hi Everyone. My name is Sean McMinn. This is my 7th MET course, and I’m pretty excited to be (virtually) here. I teach English at a university here in Hong Kong, and I love it. The job is great, the people are nice, and life is simply interesting and always adventurous. So far, I’ve been enjoying the MET programme — which has helped me advance in my career over the past year or so. In particular, I’ve been able to embed podcasts (http://campusbeat.ust.hk) and wikis into courses successfully thanks to what I’ve learned though the programme. I’m looking forward to ETEC522 because I lack entrepreneurial skills and would like to explore business opportunities … some day. More immediately, I would like to enhance my intrapreneurial (new word for me) skills. As I learn more through the MET programme I see opportunities for developing or enhancing technologies to be used at our university. To do this, though, I need to apply for funding. If I can improve on my “pitches” or selling, I would be happy.